Formed only 30 years ago, Escaldes-Engordany is Andorra’s youngest and most modern parish. It is a top tourist destination with its modern boutiques and shopping centres, although the surrounding lakes and natural reserves are also part of its charm. The parish is also known for the fine Gothic cross in the municipal square and the neo-Gothic Church of Sant Jaume. Escaldes-Engordany hosts an annual jazz music festival. The name “Escaldes” comes from the sulphurous hot springs which have made the parish a famous spa centre. One of Europe’s largest and most luxurious mountain spas is in this parish. Situated near the Gran Valira River is the spa town of Les Escaldes. It draws visitors who want to treat their bodies to the area’s soothing, sodium-rich thermal waters. 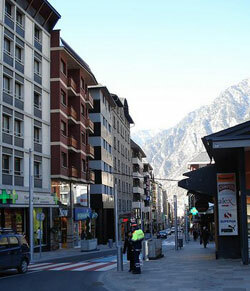 Traditional Andorran stone buildings are combined with more modern office buildings and establishments in Les Escaldes. It is one of Andorra's premier commercial areas, with a lot of stores, affordable hotels, good restaurants and hopping nightclubs. The country’s best ski slopes are also only a few minutes’ drive away.